A common misconception is that monks in Thailand are monks for life and while true for some the majority will serve only a temporary or short-term Buddhist monk ordination. This can be days, weeks, months or years and at some period during their lives most Thai men will serve as a monk in ordination. After completing their term they then return to ‘laity’ in normal life. 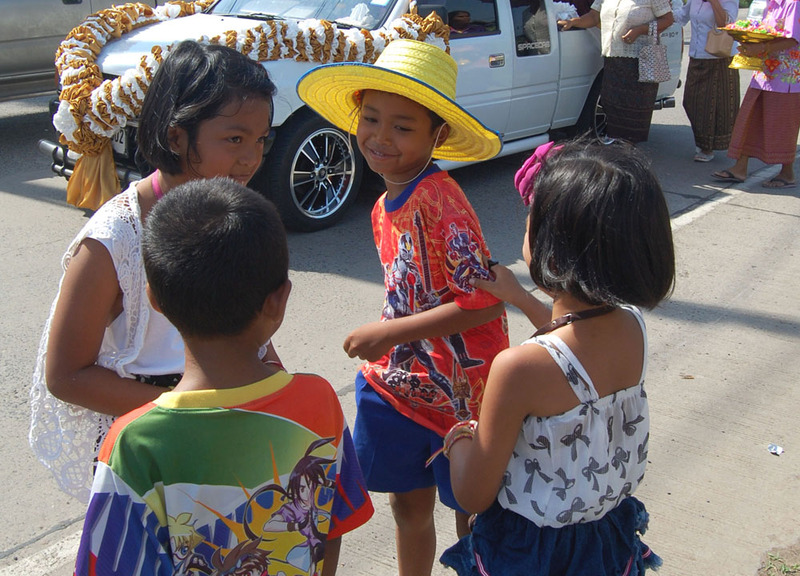 A popular period for temporary ordination is the Thai summer holidays between April and June a period where the number of monks in Thailand can double and up. Through Buddhist teachings and meditation short-term monks will be prepared to fill their future roles as good citizens. For this post I follow the process as my friend Aun is ordained in rural Thailand (Nang Rong, Buriram). From a rural background Aun completed high school before moving to the big city (Bangkok) to study architecture at University. In 2012 he graduated and before joining the job hunt he would ordain as a monk in his hometown of Nang Rong. His ordination would last one month before he returns to Bangkok to join the working world. Aun’s father passed away when he was in high-school and now Aun is the eldest male; with six sisters he is the only son of seven siblings. It is now his duty to ordain as a monk to gain merit for himself, family and most importantly his mum who cannot ordain herself. For five days before his ordination Aun would join his local temple to practice and to learn to become a monk. In the early morning he would join with the monks for “bintabaht” and will help carry food donations. At this stage, before ordaining, he is known as “dek wat” meaning he helps in the temple. After the five days he will be ready to ordain and the day before his ordination the family will help prepare Aun to become a monk. Preparation starts as locks of hair are chopped by members of his family and then his head is completed shaved by local monks. Eyebrows also go as his hair is collected in a lotus leaf and will later be put floated on a river if not kept for luck. His family then pour water over his head with blessing and a mix of turmeric and water is used to cleanse him. After washing again Aun dresses in white robes and is now ready to ordain the following morning. I unfortunately miss out on this preparation day arriving late in the evening only to hear from Aun welcoming us to Nang Rong on my Facebook check-in. After an early start we arrive to a full house at Aun’s family home and I join Aun’s friends while my mum joins the women and elders of the family. We mingle, write cards and prepare small money donations as contributions to robes, alms bowl, and other necessary items for Aun’s time as a monk. Aun is now a “Naak” he sits in the centre of the room and we each crawl up one-by-one to join him for a photo. 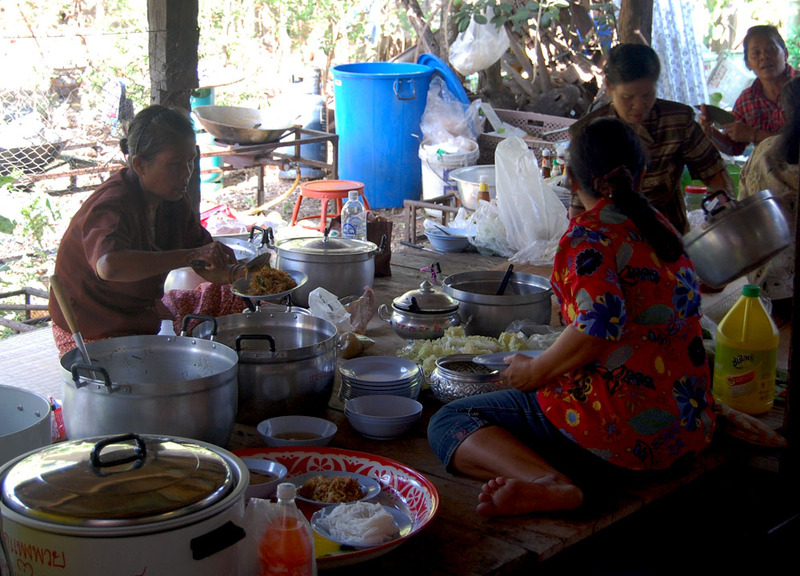 At the front of the house local women prepare a feast and tables are set for visitors. 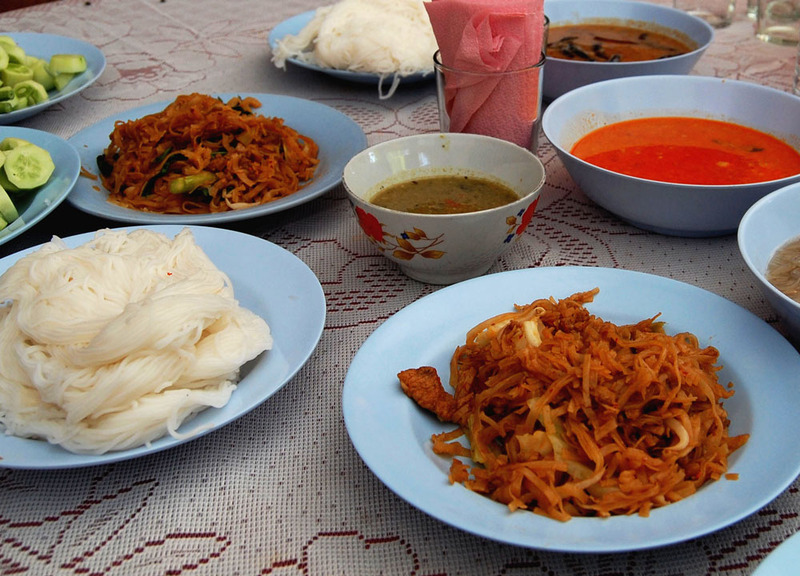 Fried noodles (pad mee), the popular celebratory snack of Khanom Jeen (rice noodles) with accompanying spicy soup (naam jeen). Extra hot dishes in the early hours is the norm in these parts of Thailand, while on my 3rd bowl of fiery soup the procession begins. 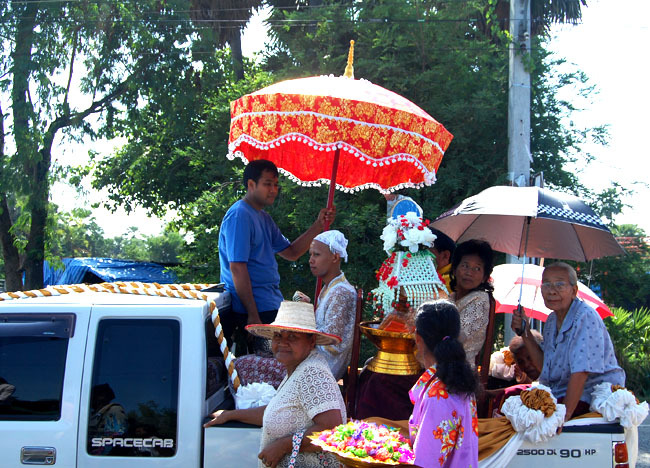 While we sit at tables Aun is carried from the house by his uncle and lifted to the procession car which is sheltered by a decorative umbrella. Aun’s feet cannot touch ground until reaching the temple. The house is then emptied as we make our way to the street for the walk to Wat Hua Saphan the local temple in which Aun will be ordained. 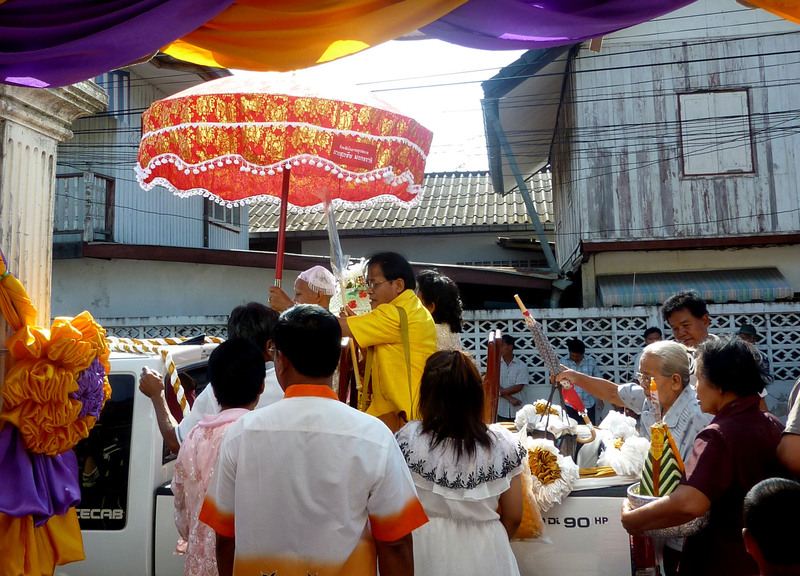 Guests carry gifts and donations to the temple and locals and neighbours appear to join the procession on the street. The celebrations begin. 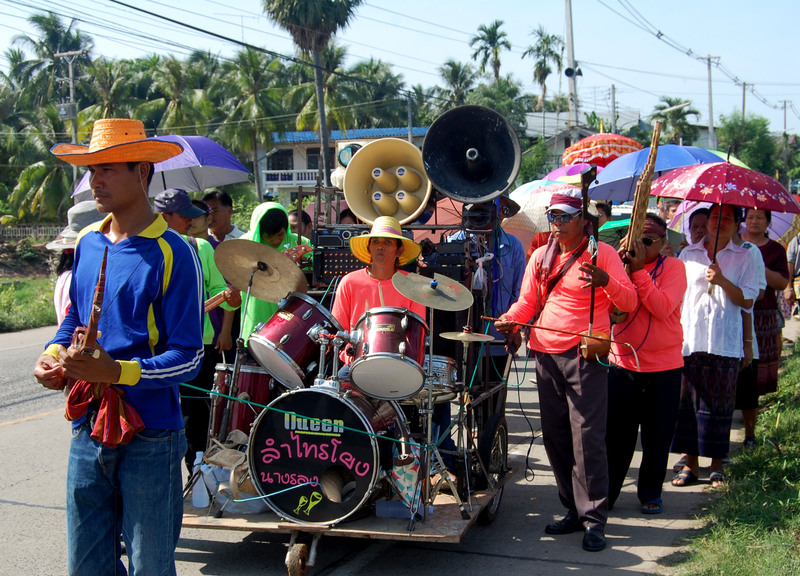 Traditional music is performed from a mobile band stand and parades of friends, family and locals dance and sing their way to the local temple. 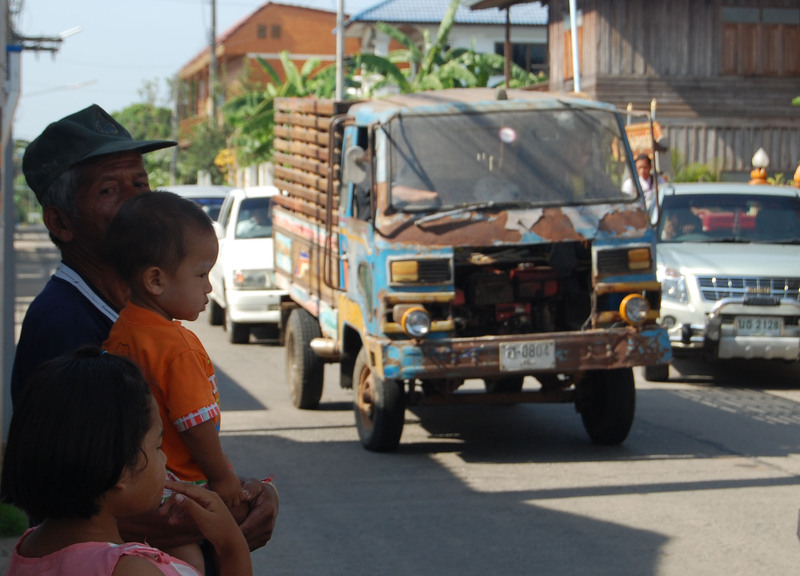 Aun and the procession car sit at the tail of the parade as the procession leads through the streets of Nang Rong. 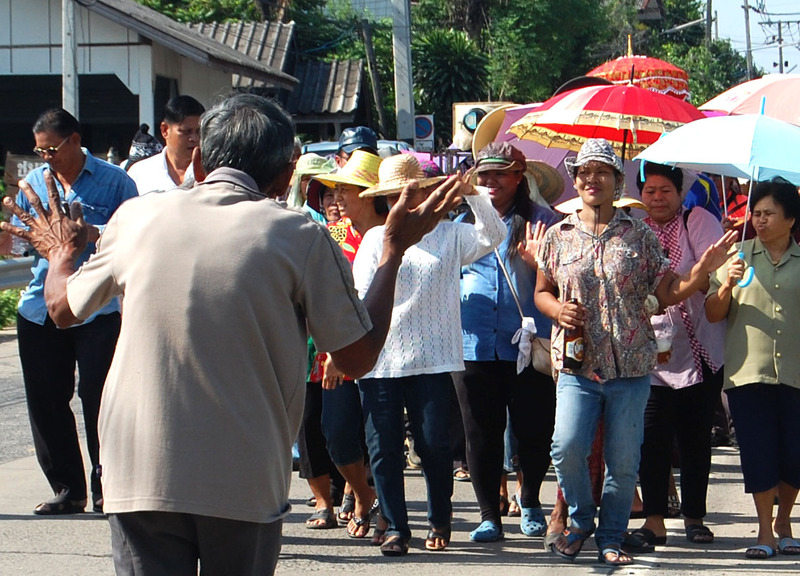 The more enthusiastic dancers join the front and the rowdier share bottles of liquors, Lao Khao (rice whiskey) and beer. We ride alongside in the refreshment car stopping at intervals to hand out bottles of water and alcohol. 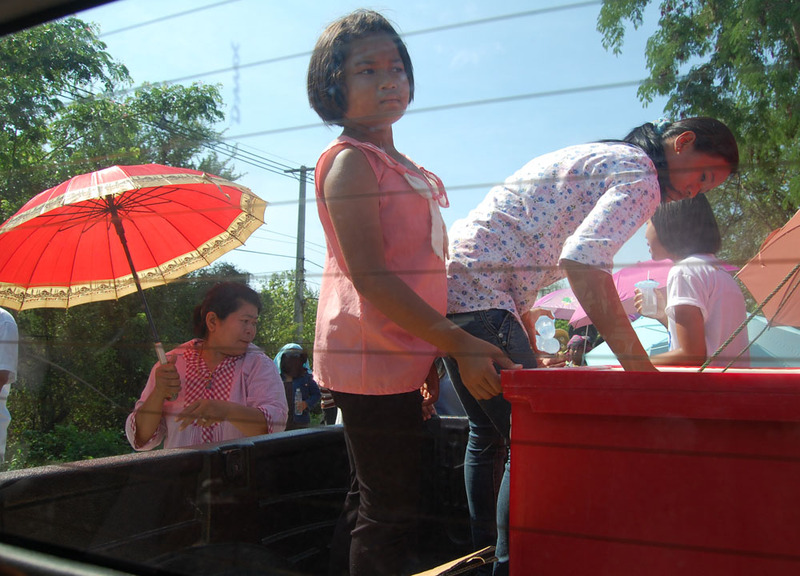 Many of the kids join the car and take on the refreshment distribution role. Each time the car stops we get out to join the celebrations. The procession arrives at temple grounds and we leave the refreshment car to meet back with friends. 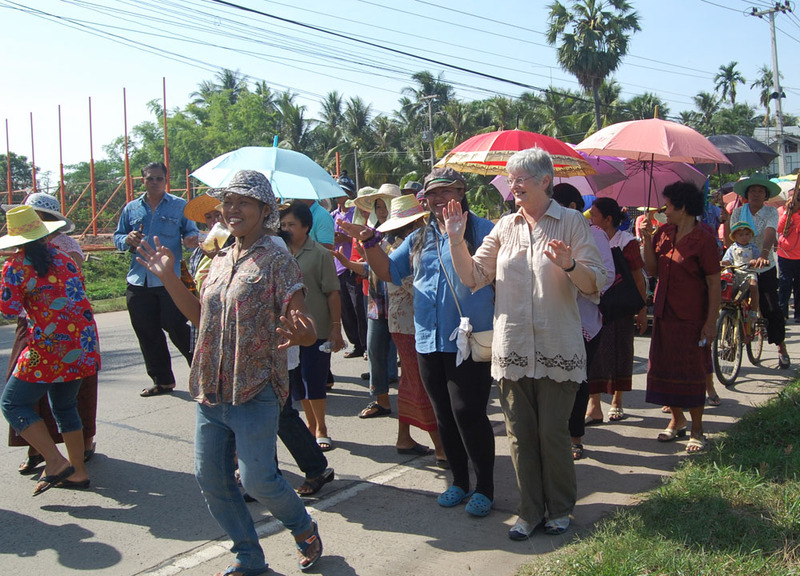 After my mum is blessed by a temple monk we join the parade to circle the central temple three times clockwise (circumambulation) in respect to Buddha. 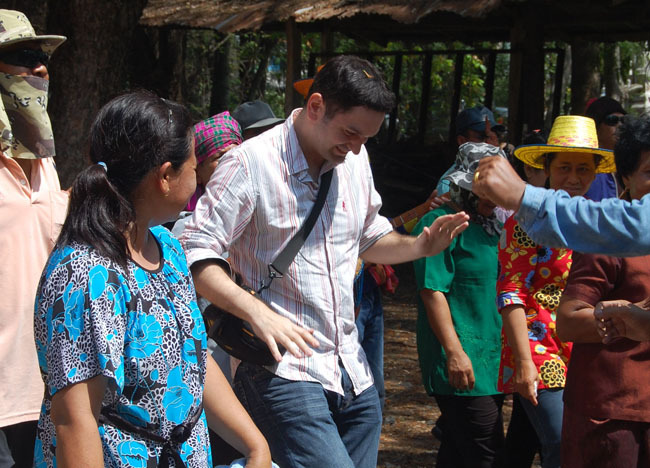 After a rice whiskey or two we mingle more and I soon find myself dancing (prancing) circles of the temple led by the procession (when a masked man tells you to dance – you dance). The procession stops at the temple and the crowd huddles in as Aun reads from Buddhist scripture. I squeeze through the crowds of snapping cameras and iPads to see Aun with his uncle reading from a sheet of paper. He is then passed a golden bowl filled with taan (coins wrapped in ribbon) and begins throwing the ribbon flowers to the crowds. We get lucky catching three. Aun’s mum washes his feet with water and he is lifted by the procession to the temple entrance touching the entrance roof as he passes. 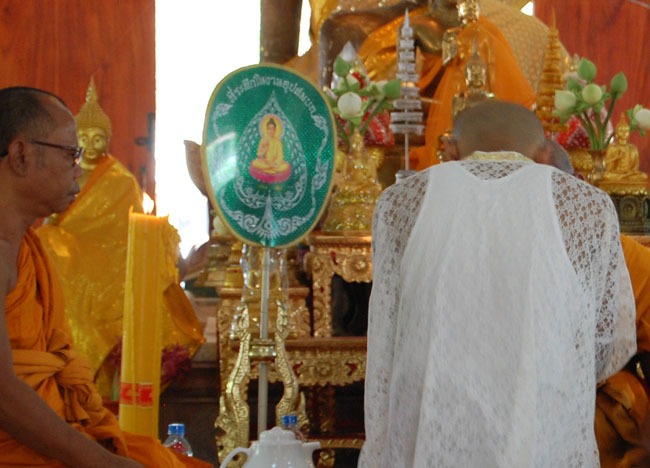 Aun joins the monks and offers incense, candles and flowers to the central Buddha before praying. 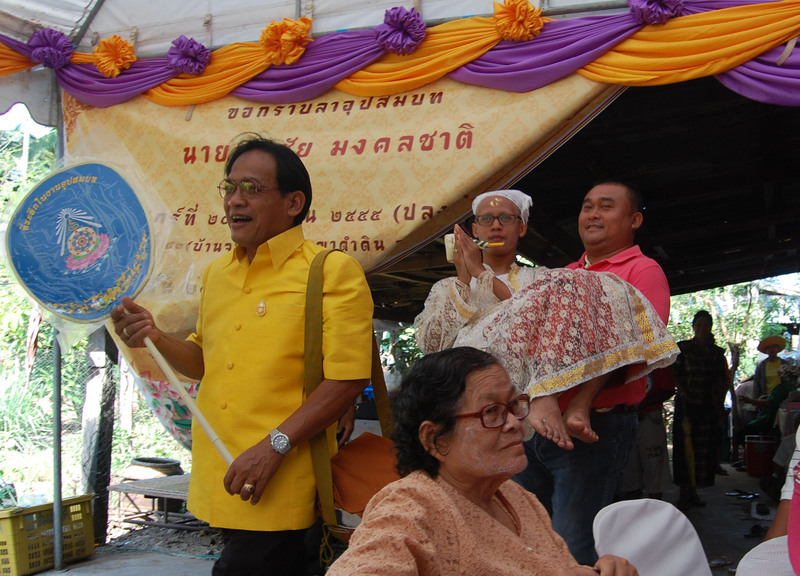 He then returns to pray with his mum when she hands him his orange robes (Phra Trai). The role of family and friends has now ended and Aun is left with the temple monks to change into robes and complete his ordination. For one month following the ordination Aun will live in temple grounds and learn basic reading, writing and memorisation of Buddhist prayers and scriptures. Everyday he will wake 3.30am, pray between 4am and 5am (Tam Wat Chao) before he walks through the nearby area for “bintabaht” where he collects donations for the temple. He returns to eat his first meal at 8am and a second at 11am. 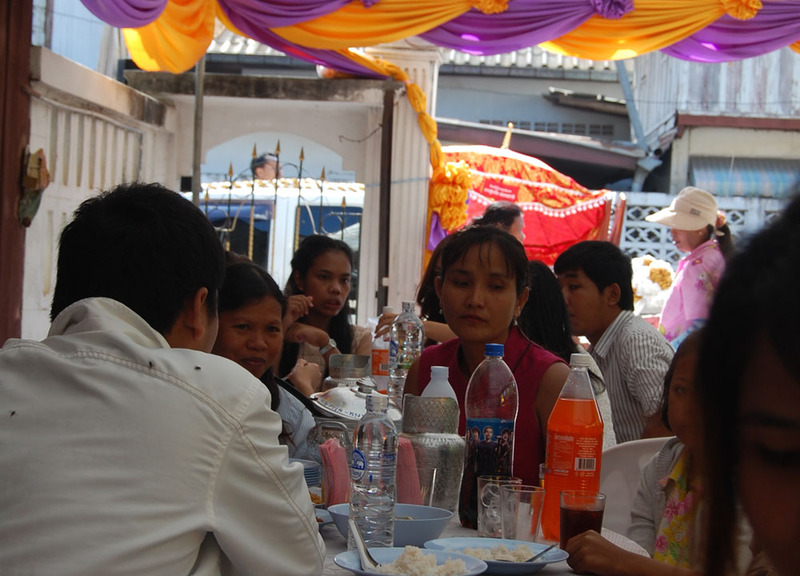 Monks cannot eat after midday. The first day Aun arrives 6am to his home for “bintabaht” where he receives donations in his alms bowl; food and rice and flour for rituals. After a month as a novice monk Aun will tell the head monk he has completed his time as a monk (lasika). He prays asking for the temple to remember him as a monk and returns to laity in his normal life. One month later he has a job as an architect in Bangkok. 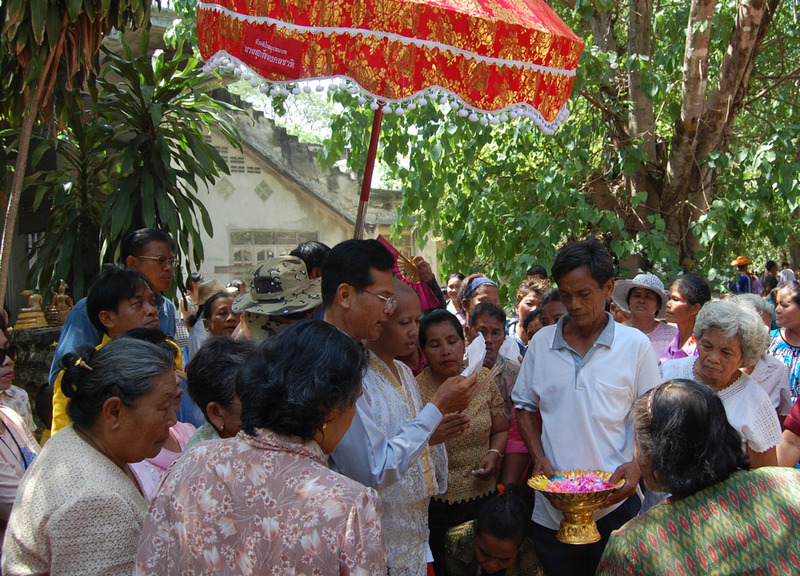 While I didn’t see Aun the days following his ordination below shows examples of the ‘Bintabaht’ ritual where monks collect donations in local areas. Thank you for writing this article. I was looking for information on temporary ordination and this has helped me. Thank you for the detailed explanation!